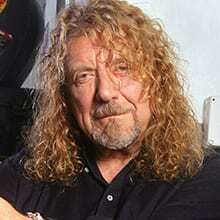 If there's such a thing as a Rock God, Robert Plant just might be it. But let's go back a bit. He grew up in the west Midlands of England, left home at 16 and kicked around in a bunch of bands. A few years later, everything changed. In 1968, Robert hooked up with Jimmy Page, John Paul Jones and John Bonham to form Led Zeppelin and together, they changed the course of music. Zeppelin took the blues, made it heavy and helped usher in the age of hard rock. 'Whole Lotta Love' was about being young and, well, horny, while ' Stairway To Heaven' just blew our minds. For 12 years, Zeppelin was arguably the biggest band in the world and influenced everyone from Guns 'N' Roses and Soundgarden to Oasis. Then in 1980, John Bonham died, Zeppelin broke up and Robert went solo. Along the way, he's embraced African and Middle-Eastern Sounds with the projects No Quarter and Strange Sensation. He's toured with Jimmy Page, played with Zeppelin now and again and paired up with bluegrass singer Alison Krauss on 'Raising Sand' - a record that won five Grammys, including Album of the Year.